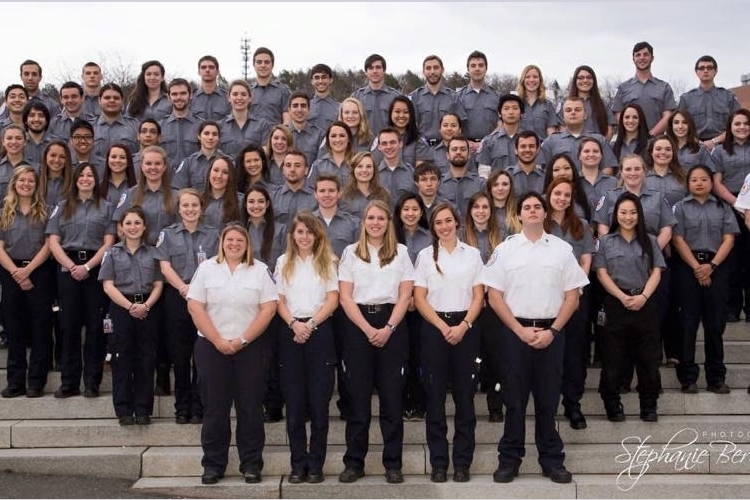 The UMass Emergency Medical Services is a campus agency of student Emergency Medical Technicians (EMTs) under Environmental Health and Safety (EH&S). Their primary duties are to provide first response medical care to patrons attending on-campus events. Do You Need EMTs At Your Event? Will there be physical contact? Will weather be a factor (hot or cold)? What is the history of the event or the performers? EMTs are a link between the University and the EMTs and Paramedics of the Amherst Fire Department as: (1) EMTs provide basic life support in emergency situations prior to arrival of the ambulance; and (2) Many of the treatments seen by the EMTs are not transported by ambulance for further medical care. By handling the less severe medical cases that do not require transport, the EMT unit helps the Amherst Fire Department keep their ambulances available for other emergency calls within their response area. During the planning process, contact EH&S for input about the need and use of EMTs. Many events can be handled with two EMTs, but through the planning and evaluation process the event may require more EMTs: this is for the safety of the attendees and the EMTs. Some events may even require additional resources like an ambulance, medical control from University Health Services, and a Command Post housing EH&S, UMPD, UHS, and Amherst Fire Department. A minimum of two EMTs is required to work together. Larger venues may need more EMTs to be present. Contact EH&S for current personnel costs for hiring EMTs for events. A minimum lead time of at least two weeks is needed for scheduling EMTs. For larger events, planning meetings should be scheduled well in advance in order to involve EH&S, UMPD, Amherst Fire Department and other associates who will be affected. Contact Dominic Singh at EH&S: (413) 545-5116, for more information, or to schedule EMT coverage. Fees associated with an extensive medical response for large-scale events (multiple teams of EMTs, ambulance coverage, Medical Control, and Command Post) can be discussed during the planning phase.